I can't tell how old this blog of mine is so I had to go and check... and this is my 370th post since February 2008! Wow! And I'm an amateur when it comes to blogging anyway and am not that active now, thanks or no thanks to twitter and before plurk, but hey I still get to post stuff here when I get the chance...and I have other blogs too: i like anything green and my lomography is my pastime, but not that active as this one - just semi-active like a dormant volcano haha. Yeah I agree may chain mail na rin nga sa blogging for sure after my few followers go and check out the blogsites that I would list down - which most are popular in their own rights anyway so this would be just more free advertising for them haha. 3. I usually am involved in organizing get together and other reunions of my close friends, for some reason I'm always the self-appointed contact person - thanks to unlimited texting! 7. I don't sing that well so don't expect me to do karaoke and I can only do a bad version of Buttercup! 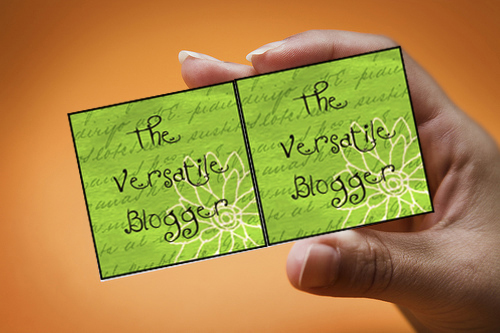 In no particular order, The Versatile Blogger Award goes to..